ONE OF INDIA'S MOST TRUSTED FINANCIAL POWERHOUSES GOES TO SCHOOL. At The HDFC School, we aim to instill the joy of learning and caring in all aspects. We believe education should enlighten young minds, help them rationalize and empower them to fulfill their dreams. That’s why our pedagogy blends academic excellence, creative brilliance, values & discipline and safety & security to create a dynamic ecosystem for young, developing minds. Our competent, experienced and progressive facilitators assist and guide the students in their journey to explore the world within and outside. 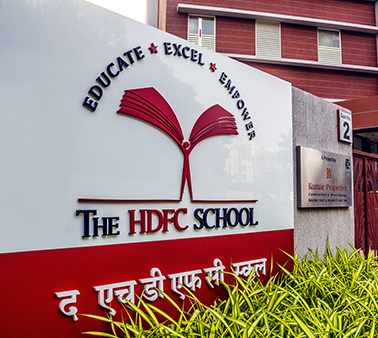 We follow a constructive approach and pedagogy with project based learning and hands-on Education at The HDFC School. Our integrated, collaborative and interactive approach helps students apply their knowledge in real-life situations and contribute to their holistic development. We follow a CBSE curriculum and provide students a holistic, balanced education that’s a combination of various co-scholastic programs, physical education & sports activities, community-school initiatives and parent-school programs.